VTT Technical Research Centre of Finland is helping to solve the global marine plastic waste problem. In a project called PlastBug, the institution develops a mobile container unit to remove plastic waste from ocean areas, in order to create a safe living environment. This year researchers in the PlastBug project have been searching microbes that are capable to degrade different kind of plastics (PE, PP, PS or PET) and developed methods for the pretreatment of plastics. Researchers are currently using a three-stage screening method to screen microbes from different sources. “Some microbes have already passed through the first two stages of the screening. In the third stage, we will confirm are they capable to consume and digest plastic. 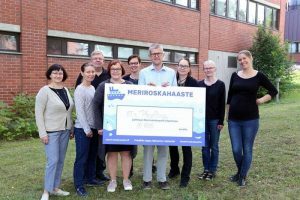 In the next step, if plastic degrading microbes will be found, we will improve the ability of the most effective microbes to digest plastic, and we will develop plastic pre-treatment methods further to ease the work of the microbes,” says Koivuranta. A complete process is being engineered around the fermenting unit containing microbes – a small plant in which plastic is modified from waste to products. The aim is that the pilot unit will operate on the Baltic Sea in 2021, but funding still needs to be secured for the realization of this plan. If the process can be made to work effectively enough, the PlastBug units can progress to commercial production and operate in different locations around the world. The Plastbug team took second place in the Meriroska (Marine Litter) Challenge arranged by the Finnish Environment Agency on 25 August 2018. This annual project is part of VTT’s iBEX programme, which aims to achieve rapid, bold solutions to problems.